Back in the 80’s, Mrs. E. was a Cutco knife salesperson. She did very well at it and determined then and there that she would never go into sales. Which is why she is a pushover for former students of hers who come a-knocking with the wonder cutlery that is never beautiful, but works beautifully. We were the proud recipients, in recent days, of the best pair of kitchen shears that I’ve used. Not only do they separate for cleaning and sharpening, they look murderous. Until last night, they remained untested by anything more strenuous than pizza or herbs. So I bought a whole chicken with the intention of butterflying, marinating, and grilling it. This was the absolute first time that I tried to butterfly anything and I was prepared for a fight. Sleeves rolled up, poulet rinsed and patted dry, the Cutco shears and I made the first tentative snip along the backbone. I split the bird asunder with frightening ease and continued along the other side of the backbone, removing it in short order. Cutting through the cartilage was even easier. The butterfly within had been freed. I counted all ten of my fingers. What could be easier or more elegant than avoiding the Julia Child-like hacking away that was the order of the day before industrial strength kitchen shears were made available to the amateur? Place the floppy result in a gallon sized ziplock bag with 6 tablespoons of commercially produced Hungarian Pride of Szeged chicken rub (or mix: minced garlic, paprika, basil, oregano, salt, pepper and onion together. A fair approximation, but lacking that MSG zip.) Add a good, long four count pour of olive oil and the juice of one lemon to the bag. Zip it shut and shake it around to coat the chicken. Refrigerate for 4 to 6 hours (or two as I did…. 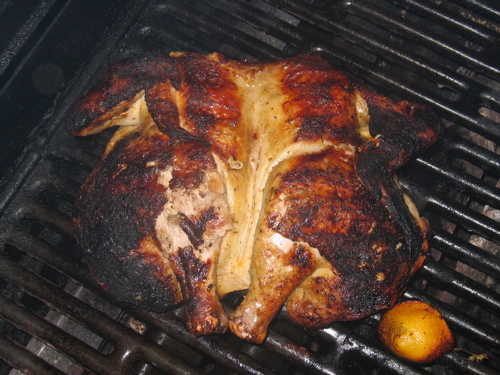 ), heat the grill to low-medium and cook over indirect heat (or don’t. It didn’t seem to hurt the bird when the fire flared up a bit) for about an hour, flipping once. If it’s a bit underdone, cut it in half and microwave each half for three minutes on high. Serve with a salad dressed with a garlicky vinaigrette and crusty bread. We uncorked a very nice 2007 Côtes-du-Rhône Samorëns blanc from Ferraton Père & Fils to drink alongside, but a Sauvignon Blanc would also work well. As a final word of warning: I had to skip breakfast and run an extra couple of miles today since I dispatched half the chicken, myself. Mrs. E. was kind enough to leave me a leg and thigh for my lunch today. Unfortunately, the wine’s gone, too. This entry was posted in Entertaining and tagged chicken, cooking techniques., grilling, recipes. Bookmark the permalink. That looks wonderful! I have never attempted to butterfly anything. I’m always afraid it will be a huge hassle, but now I’m intrigued. I kind of hope a Cutco salesperson comes our way this year. I could use a pair of those shears! Just bought a pair from a darling life guard/college student who was so nice to the boys when he said, “Don’t run!” I adore them – weighty and perfect. And dishwasher safe! We shall now name you easy and elegant scissor hands. Yes – we have some cut-co items too, all to help a college student and former babysitter. Butterflied anything is wonderful on the grille. I believe this method of preparation is also referred to as “spatchcock”…flattening of and removing the backbone of a chicken in preparation for grilling. Great use for the kitchen shears. I remember Cutco doing a demonstration where they cut a penny in half using those scissors. Love your blog…………first visit, but I will be back! Thank you Ms. Moates. I’m enjoying yours, too. Sir Flutter, not recommended. But isn’t it nice to know you can? LuLou, it’s a breeze with the right tools. Mrs. PvE, especially with the hair. Were that I were so talented otherwise!